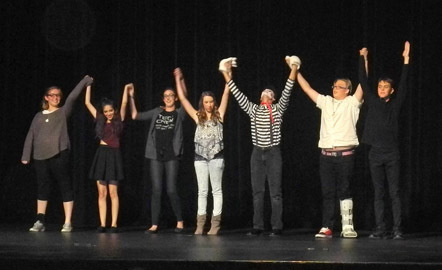 Performers in Artesia High School Drama’s production of “Audition” take a bow following a free performance of their 2016 NMAA State Festival piece Tuesday at the AHS Auditorium. Pictured from left are Delaney Kolb as Robin, Maraya Esquibel as Jules, Darian Peterson as the Stage Manager, Shawna Johnson as Kelley, Nolan Winters as The Artist Formerly Known as Question Mark, Harley Williams as Actor No. 5, and Lowell Irby as M.R. Irving. “The Audition” offers a zany, humorous glimpse into the audition process for a local theatre production of “Medea.” The students will perform the one-act at 8:45 a.m. Friday at the New Mexico State University Center for the Arts in Las Cruces.